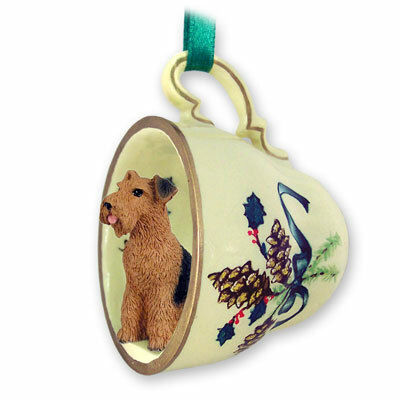 We combine our Tiny Ones series of hand painted, breed specific figurines with our Green decorated tan tea cup to create a delightful three dimensional ornament perfect for any special occasion like birthdays or Christmas. Great item to hang on your Christmas tree or an everyday display as well! Each tea cup is 2” tall and 2 ½” wide with a molded handle which has a green ribbon tied in a bow! The tea cups are even decorated INSIDE with a gold toned rim and decorative stripe on the handle. On the outside, both sides have a tiny delicate pine cones, plus berries and leaves. These unique items are stone resin and individually blister packaged, ready to give as gift or hang in your store. PLEASE NOTE- Sturdy metal Display stand (OH1) is available; see the tea cup display category!